A few weeks ago Maybole Pipe Band traveled to Arran for the Brodick Highland Games and with them went a young German intent in taking part in the heavyweight competition. 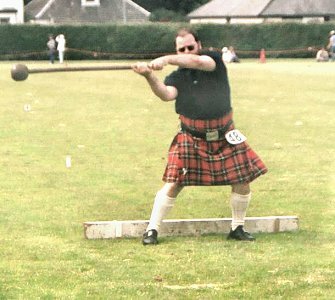 Fitted out in the kilt he took his place in the field and fulfilled a dream, he shot putted, threw the hammer, lifted the barrels and attempted to toss the caber, only his height restricted him from competing in throwing the hammer over the high bar. Behind him cheered 52 people from Maybole, band members and friends of this extra ordinary man. In 1998 Kai Uwe (oovah) Stutzkeitz arrived in Scotland to work, as a waiter at Turnberry Hotel, his reason for doing so was quite simply to improve his English. He had already qualified as a chef in his native Germany and had spent one year in the Bavarian army under the German national service system. He also undertook a journey around most of Europe by car and then traveled to the Far East to complete a year out of studies and army life. Being an outgoing young man he soon discovered the night life around the area and much of his free time away from the hotel was in the pubs and clubs in South Ayrshire. In particular Kai visited the High Society bar in Maybole and made many friends with the locals there. All were very interested in this young German who frequented the bar, smoking a pipe and soon real friendships were made. This was the point where many lives have changed, not only Kai's but to all who decided to befriend him. 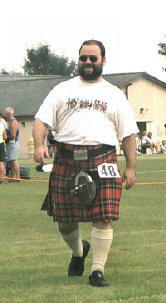 He had a typical Scottish sense of humour which help him to endear himself to everyone around him and he was also eager to learn the dialect as well as slang words and phrases, needless to say he was caught out on numerous occasions with his willingness to try out his new words on unsuspecting females, on his most recent visit he did not accept that there was only one meaning for the word fankle and refused to use it. Kai lived in Scotland for a year and learned an embarrassing amount about the lifestyles of the Scottish people, their cuisine, drinking habits and most importantly whisky. The Germans love Scottish whisky and Kai was no exception, he traveled all over to sample and buy whisky and shipped them home to Germany where they would play an important part later on in his life. Eventually Kai left Scotland to return to Germany and settled in the Heidelberg area, he worked in an hotel before opening his own restaurant in Malsch, a small town to the south of Heidelberg. As a close friend of Kai, I went out to visit him on several occasions and was present at the opening of his restaurant. He was still as enthusiastic about Scotland as ever and I was to play the bagpipes in full uniform to show the people that he was not just stocking whiskies and having Scottish nights without some authentic touch to it. Ever since I have traveled out 3 or 4 times a year to play at Scottish nights and whisky tasting events, as a piper of course. Accompanying me have been a host of his Scottish friends to experience for themselves the way an ordinary German lives his life and how much knowledge they have gained about Scotland from reading and most importantly from Kai himself. During that time we have picked grapes, visited beer and wine festivals, trade shows, hockey matches, played tennis, played at a volleyball match for the national ladies team and mixed with people from all walks of life: wine growers, vets, butchers, students and lots of others. The most talked about and biggest event of the year is his official Burns supper where his friends from Maybole are always welcome. We try to share our Scottish traditions with the German people in the best social circumstances we can offer, good eating, drinking, music, songs and poetry and most of all friendship. We take with us the essential ingredient, haggis, neeps and tatties, shortbread and more whisky. Kai's whisky collection is over 200 bottles of malt and is arguably the biggest in the area (if not the country). He offers the finest German cuisine in his restaurant but people come from near and far to sample the whisky he has on offer. His knowledge of whisky is quite unbelievable, he has a fantastic sense of taste, a memory that could describe characteristics in any food or drink and a preciseness to detail that would attract you to sample anything knowing that what he has described is exactly what you experience. Kai is also a lover of cigars and pipe tobacco and has a humidor to match his whisky collection. His friend Jens deals in tobacco and they have raised an idea to flavour tobacco with whisky hence their latest trip to Scotland to buy empty whisky casks and believe it or not a full cask of whisky. Kai tries to travel to Scotland as often as possible but always makes it for the guitar festival in Kirkmichael and the Arran games. 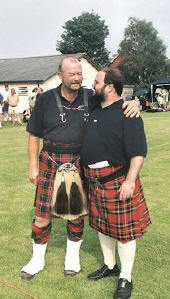 He brings friends with him and shares his knowledge and Scottish friends with them as we do likewise. Many people who read this would have met or know Kai to speak to or to see. Whilst walking up Maybole High Street last week he was recognised by many people and he turned and said to me, "this place is more like home than the place I stay". Kai has a great love for Scotland and its people and we have helped him to see and to understand what Scotland is, but most of all this young man from Germany has given a lot of people from Maybole an insight into his native land and given us a great deal of laughter, kindness and plenty of friendship.